Mental Health Art Project - are you willing to be vulnerable? 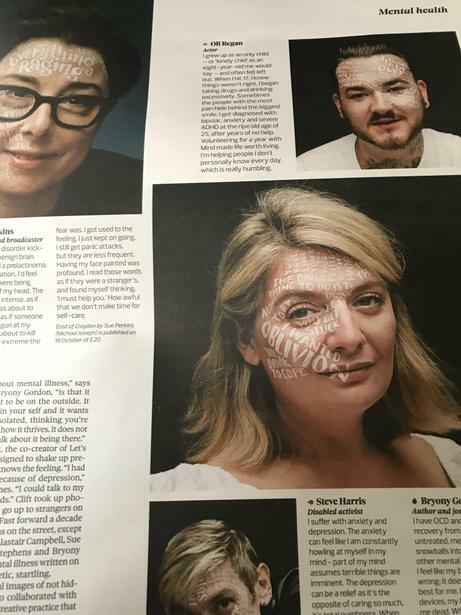 In yesterday's Observer newspaper, there was an excellent piece about mental health and how people feel when they are dealing with anxieties, behaviours etc. The thought of painting your thoughts and feelings onto your body is scary but also quite freeing. We would like to produce a whole Imperium version of this (Waterside and King's Oak), where staff, pupils and parents are invited to have either their face or arm painted (in case you don't want to dazzle the world with your beauty), with the words or phrases that make you feel the way you do. We would use our digital art students at King's Oak to take the pictures then get them professionally printed to create a really meaningful piece of art. If you would like to take part - and we hope you do, can you let me know via the comments section below and then we can organise the date for you to come in, be painted and photographed. Mental health affects every single one of us - so let's be proud about our vulnerability and stand together as one big family.